It is time for another round of The Blended Blog Asks. This month's theme/topic is Giving Thanks and I feel like this year, I have a lot to be thankful for. 1. Have you ever kept a Gratitude Journal? Yes or No? No I haven't. 2. Hosting Thanksgiving at your house? Yes or No? No I have not. But I do host Christmas dinner at my house each year. 3. Favorite Food from The Thanksgiving Meal? This has to be a toss up between green bean casserole and mashed potatoes and gravy. I love the classics. 4. What one thing in Nature are you most grateful for? The changing weather and how beautiful it is. 5. Pumpkin Pie: Yes or No? OH very much YES. I love pumpkin pie and homemade whipped cream. I have been dreaming about pumpkin pie for months. 6. Traditional Cookbook: Yes or No? Most of the time yes, but we do branch out a bit sometimes. 7. Oven Baked or Deep-Fried Turkey? Oh I love them both ways, but I usually eat more of the oven baked turkey. 8. Thanksgiving Leftovers: Yes or No? I like a Thanksgiving leftover sandwich the day after, but usually that is it. I gorge myself way too much on the day of to want to eat any leftovers. 9. 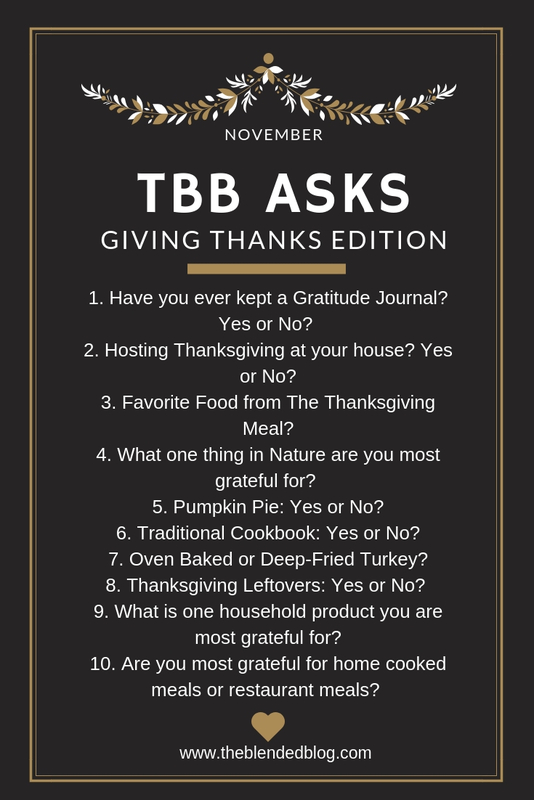 What is one household product your most grateful for? Paper towels....maybe because there is always so much to clean up and it is easier to use paper towels. 10. Are you most grateful for home cooked meals or restaurant meals? Home cooked meals all the way. I love going home for the holidays and having a traditional home cooked Thanksgiving meal. I completely forgot about Paper Towels, Love my Bounty so much. Super fun reading your answers, Happy Monday! Haha. Mine too. I go through way too many of them. Happy Monday to you! haha paper towels!! OMG, I'm all about select a size and everyone makes fun of me because I always have a huge thing of them in my storage closet. Yes please to homemade pumpkin pie with homemade whip!! With my family, it's just easier (for many reasons), to go out to eat. It's actually really enjoyable. I also don't get the day before or the day after off which makes having to cook, really really hard. Paper towels is a great thing to feel thankful for! Nice Q/A.. I do keep a gratitude journal.. though it's more of a line a day kind. I'm so with you on homecooked meals! You know, I'm not a huge fan of leftovers, BUT we found this recipe last year for Thanksgiving waffles, and we're officially obsessed haha I'll have to post it. It's probably not for everyone, but for us...omg. YUM. Oh please do post it. I can't wait to try it. We, thankfully don't have to cook for Thanksgiving. My in-laws always have it. I can't believe we're talking Thanksgiving again. It comes around so quickly. Saw your link on blovedboston. We are going to family's house this Thanksgiving too!!! It is crazy how fast everything comes around. Soon it will be Christmas. Thanks for stopping by!!! Pumpkin pie is my FAVORITE! Oh man, so good. Hardly anybody in our extended family likes it, though, so we rarely ever have it. Soooo good. I can't wait for it. Total bummer. You should make one!!! hmmm... looks like my post disappeared. weird. I could do with some mashed potatoes right about NOW! And yes to paper towels!! Amen to the paper towels. Oh I love mashed potatoes, green bean casserole and the pumpkin pie! This post gave me all the feels for Thanksgiving! Happy Monday! It gave me all the feels too!!! You always have to make homemade whipped cream!!! Yes they are!!! We use way too many! Mmm I love the classic sides too! This is getting me hungry for Thanksgiving dinner!! !